Info "We're the Ball Balancing Trio and we love balancing on balls. Well, that's not exactly true. We just hate getting yelled at!" 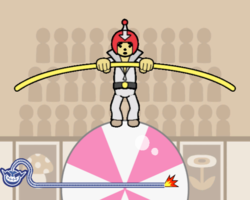 Keep Your Guy on the Ball is a Microgame in WarioWare: Smooth Moves. It appears in Mona's stage and sometimes Jimmy T.'s. It is a pun on the phrase "Keep your eye on the ball". The player controls a character and must not fall off the ball in a destiniated time. 1st level difficulty: The player control an acrobat who holds a balancing stick. 2nd level difficulty: The player controls a panda who holds a bamboo. 3rd level difficulty: The player controls a robot with a small wrench. In the background, the wall have pictures of a mushroom, a star, and a strange flower, a reference to other Mario games. This page was last edited on February 19, 2018, at 16:35.